Hortus Camdenensis | Achillea millefolium L.
Fully hardy herbaceous plant with small white flowers in dense, flat corymbs. There are many garden cultivars with rose, red or yellow flowers. To 90cm. Tendency to be invasive but easily controlled. [RHSE, Hortus]. An ancient medicinal herb. The leaves were used since mediaeval times to staunch the flow of blood from knife or sword wounds. It was also widely used as an antiseptic, antispasmodic, expectorant and gastric stimulant. [McLeod]. ‘The stalks grow about eighteen inches high and are somewhat hairy; the flowers are white and grow on the tops of the branches in flat umbels. It grows in most fields and flowers in June and July. The leaves are esteemed cooling, drying. 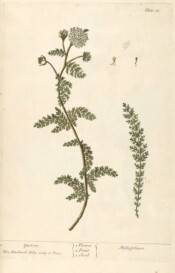 binding, serviceable in all kinds of haemorhages; as spitting or vomiting blood, bleeding at the nose, dysentery, the too great flux of the menses, violent flooding, cooling and tempering its immoderate sharpness; it is good in gonorrhea, strangury, heat of urine; when applied outwardly it is of service against ruptures & staunches ye bleeding of fresh wounds.’ [Blackwell pl.18/1737]. Listed in the 1845, 1850 and 1857 catalogues [H.1/1845]. Possibly introduced as a medicinal herb rather than garden ornamental.